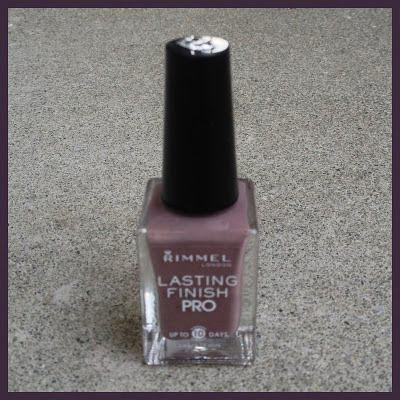 What I Blog About When I Blog About Books: NOTD: Rimmel "Steel Grey"
Today's notd is an old one I probably purchased 2+ years ago. I got this around the same time I purchased Sephora by OPI's "Metro Chic." The two polishes are very similar so I'm not sure why I got both. However, I found the brush of this polish frustrating to use to I gravitated towards "Metro Chic." I finished that polish off about a year ago, so unfortunately, I don't have it to do comparisons with, but I do remember them being very, very similar- possibly even dupes. As I mentioned earlier, I find this polish a bit frustrating. I don't like the proportion of the brush to the mouth of the bottle (similar to Sally Hansen Complete Salon Manicure line). As a result, I ALWAYS end up painting thick layers of this polish. (Consequently, I stopped buying polishes from this line). Aside from that, the formula itself is nothing to complain about. 2 coats provides opaque coverage. I can't attest to the "10 days" claim since I don't wear my polish for that long, however, for the 3 days I did wear it, it held up fairly well. "Metro Chic" was my favorite polish for so long. It was a polish I would remove when it chipped only to paint my nails in the same color. 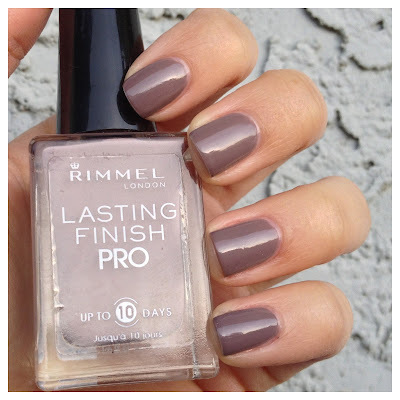 However, I haven't been able to justify purchasing a second bottle knowing this Rimmel polish is still sitting in my collection so I'm waiting until I can use this up before I can repurchase the SOPI one. However, if you like this color, aren't as picky as I am about nail brushes, and want a cheaper alternative, Rimmel's "Steel Grey" is a potential pick. My nails are bare right now :0! I was happy when I saw this polish! 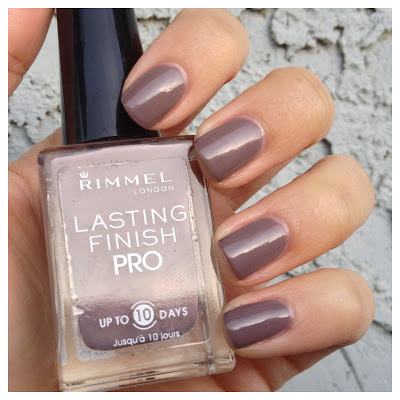 I own this shade as well and it's one of my fav Rimmel polishes (out of the 3 I own.) before reading your review I guessed the brush wouldn't be to your liking and I was very much correct! I wish the Rinnel brand offered more unique color options...I would love to try more. Steel Grey is a gorgeous color!